Yesterday as I was reading my beloved P. G. Wodehouse, I came across something startling. 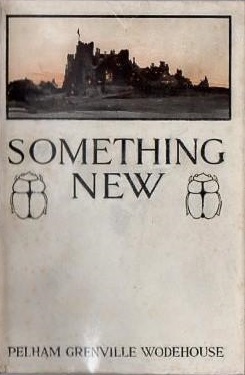 I read a scene in Something New, first published in 1915, that was almost identical to a scene that I had read in Mike, first published in 1909. Wodehousian tales often follow a certain formula—some young fellow ends up in the soup, and some eccentric fellow fishes him out again. However, this scene was more than merely reminiscent of the earlier one. In both stories, a minor crime has been committed. In both stories, a comical authority figure means to get to the bottom of it. In both stories, the alleged criminal upsets red paint and leaves a clear footprint. In both stories, the comical authority figure goes in search of a shoe splattered with red paint. In both stories, the comical authority figure unwittingly enlists the aid of the alleged criminal’s friend. In both stories, once they find the shoe, the friend, quickly sizing up the situation, makes a substitution. In both stories, the comical authority figure breaks furniture and looks foolish. In both stories, it turns out that the person who stepped in the red paint wasn’t the criminal after all. For the Doctor Watsons of this world, as opposed to the Sherlock Holmeses, success in the province of detective work must be, to a very large extent, the result of luck. Sherlock Holmes can extract a clue from a wisp of straw or a flake of cigar ash. But Doctor Watson has got to have it taken out for him, and dusted, and exhibited clearly, with a label attached. The average man is a Doctor Watson. We are wont to scoff in a patronizing manner at that humbler follower of the great investigator, but, as a matter of fact, we should have been just as dull ourselves. We should not even have risen to the modest level of a Scotland Yard bungler. We should simply have hung around, saying: “My dear Holmes, how…?” and all the rest of it, just as the downtrodden medico did. For the Doctor Watsons of this world, as opposed to the Sherlock Holmeses, success in the province of detective work must always be, to a very large extent, the result of luck. Sherlock Holmes can extract a clew from a wisp of straw or a flake of cigar ash; but Doctor Watson has to have it taken out for him and dusted, and exhibited clearly, with a label attached. The average man is a Doctor Watson. We are wont to scoff in a patronizing manner at that humble follower of the great investigator; but as a matter of fact we should have been just as dull ourselves. We should not eve have risen to the modest height of a Scotland Yard bungler. What makes this duplication more interesting is that the two novels deal with quite different subjects. Mike describes English public-school life, while Something New is about an American who finds himself involved in the upstairs and downstairs worlds of an English country house. After a little internet research I discovered that Wodehouse’s original audience would not have seen the duplication. Mike was only published in England, but Something New was published in both England and America. Only the American version of Something New, however, had the scene about the red paint. I wonder where the impetus for the duplication came from. Did Wodehouse really adore the scene and wish that Americans could read it? Or did his American publisher ask him to make the book a little longer, so he lifted a long passage from Mike because he faced a tight deadline? Now that I’m over my initial shock, Wodehouse’s duplication comforts me a great deal. Sometimes I feel that I run out of things to say. I only have so many good ideas. It seems that even one of the most prolific authors of English prose felt the same way at times. So what will I do next time I can’t think of something new? I’ll write something old again. Next time I’m faced with a self-imposed blogging deadline and writer’s block threatens to crush me, I’ll return to the things that I care about the most. I’ll try to put them in a new context and look at them from a new perspective, but Wodehouse has taught me that it’s okay to repeat myself. Previous Lance Armstrong’s Confession: Good for the Soul?